Do you stay or do you go? That is the question today as you seem to be on your way out of one situation yet not quite ready to leave it all behind. As you move from this situation there seems to be some need for you to do it with stealth or without quite being seen to be doing what you are really doing. If you are in a rocky relationship be aware that your partner may be on the way out the door without you realising it as they are playing a two sided game whereby you are not sure where you stand with them and their actions/words are not aligning with what is actually going on. Hopes and dreams may not be clear as can be seen from the different shaped stars in the sky. What you hope when you wish upon a star may not be the same as what you actually get. You need to be ready for anything as circumstances can change at the drop of a hat. There is more “unspoken” than “spoken” within this card. 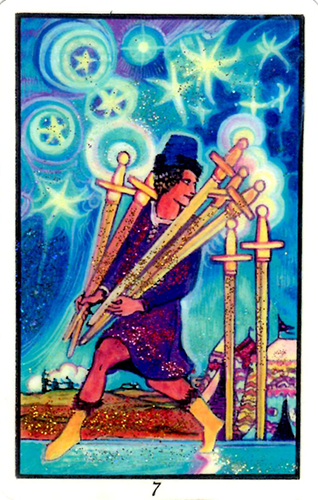 The 5 swords being carried away heavily outweigh the 2 swords left which means you are only being told a part of the story and a small part at that. Do not expect to know the whole truth or all the facts as only the person doing the leaving knows this and they are more than willing to take their secrets with them as they go. Keep in mind that if you or the other person do decide to return the door is still open although this may not always be the case. Today’s tarotscope — Seven of Swords — comes from the Illuminated Tarot series which was self-published by Carol Herzer. There are several versions of these recolored Rider-Waite decks, each more beautiful than the last. This card is from one of her Divine Sparks of Light versions. You can read more about the genesis of Carol’s foray into hand-painting and re-colorizing these decks on her site, Soul-Guidance.com. They are also available for purchase directly from Carol. Email her first for details. Please also check out the Soul-Guidance YouTube channel. Used by generous permission.